SINGAPORE (THE NEW PAPER) - After a road accident in Thailand last October left him paralysed from the neck down, Mr Muhammad Haikal Johari worked hard to get back on his feet. The 39-year-old still needs to use a wheelchair, but he has regained partial control of his body. His wife, Madam Rafiqah Soh, also 39, let on that he was already "back at work" even when he was still warded at the National University Hospital's (NUH) Rehabilitation Centre at Senja. He was discharged in May. "Before he was discharged from the rehab centre, he had started working on the menu at Alma, just not physically," she told The New Paper. Mr Haikal, who was an executive chef for the Water Library group in Bangkok, was involved in a motorcycle accident in Pattaya last October. All he remembers of the accident was waking up in hospital after he left on his Yamaha R1 superbike to head to a bike circuit. "If I were still in Bangkok, this Michelin star would not have happened to me. "I had been working (in Bangkok) for more than 10 years, and that is what I was praying for - to be the first Malay chef to get a Michelin star. "But it would not have happened, if not for the (accident)," he told TNP. "So I am not actually complaining too much," he joked. In April, TNP reported on Mr Haikal's fight to recover. His high cervical nerves on his spinal cord had been damaged, leaving him paralysed from the neck down. He was unable to speak and relied on a ventilator to breathe. With daily physiotherapy sessions at NUH, he slowly regained some movement in his legs. Now, he can get up from the wheelchair to walk as long as someone supports his body. With a chuckle, Mr Haikal said: "I have to do it, no choice. Goodwood Park Hotel is a heritage building. There are no ramps." He can also move his right hand again. "Each day brings a lot of recovery. Previously, (my right hand) was just dead, but now it's moving. I can shake hands with people... It's a little weak, but still, you know, it's a lot of recovery," he said. Once he enters the kitchen, Mr Haikal sits in his wheelchair in a corner and watches his culinary team like a hawk. Madam Soh, who used to be a housewife, is now always by his side to see to his need whenever he is at work. "I give directions (to the team) like I'm the one (preparing the food)... I look out for what is unusual, like customers complaining," he said. But his inability to be hands-on sometimes overwhelms him with a mix of helplessness and frustration, especially when the kitchen gets busy. "If I were physically fit, I think it would help (the team) a lot more. Things can be done much faster. "I just wish that one day, I will get so frustrated that my body will just tell me to get up, walk, and do it," Mr Haikal said. Until then, all he does is take a deep breath, pray, and be thankful. "I am thankful to God that (my condition) is not worse than it is because I have seen worse," he said. "Most of the nights are pretty tiring, not just for me but also for my wife because she is there every day with me... Many people tell me I need to have a good rest, but work is often at the back of my mind. "I won't say it is pressure, but you think you are your old self and you can do many things at one go. But the body is no longer the same. It needs more rest than before," he said. There are days when Mr Haikal wakes up thinking that he has recovered, only to be disappointed. "When I realise I have spasms early in the morning, and I cannot control my body, it is a reality check. "Of course, reality can be quite cruel. But it also humbles you," he said. Does he think he can walk again without needing help? With steely eyes, he said: "Yes, I can." Madam Rafiqah Soh admitted that she much prefers the lifestyle she had before her husband's accident. "I was not working, was caring for my children full time, and had my own lifestyle. I could go out to exercise. "Now, I am following him everywhere he goes. There is not much of me-time left," the 39-year-old said. 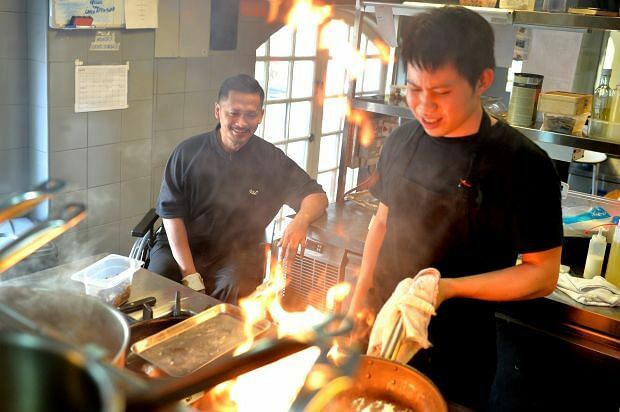 Her husband, Mr Muhammad Haikal Johari, also 39, works six days a week at Spanish restaurant Alma by Juan Amador despite being mostly wheelchair-bound. But do not get her wrong - Madam Soh is happy for her husband. Recalling seeing her husband in hospital after the accident, unable to respond and staring blankly, she said: "I'm actually grateful that he has reached this stage. At this moment, it is considered quite a fast recovery." If there is one thing that has not changed since the accident, it is Mr Haikal's workaholic nature, Madam Soh told The New Paper with a laugh. "We have known each other since we were 18. We dated for seven years before we got married. I understand his work attitude. "He is just like his mum. They always feel that it is not nice to reject other people. They think they can do everything that is asked of them," she said. Although Madam Soh thinks the newly-awarded Michelin star is encouragement for her husband, she feels he is not getting the rest he needs. Calling him stubborn, she said: "When I tell him (to rest), he will say, 'But I still got a lot of things to see', or 'I still need to plan the menu', or 'It's a very crucial period and all these things must be done'. "There are many things on his mind." Madam Soh longs for the day Mr Haikal is more independent so they can pay more attention to their son, eight, and daughter, 13. The children leave for school early in the day and are asleep by the time the couple get home. "When he becomes more independent, we can spend more time together in different ways, not just ferrying him to work. We can have more family bonding," said Madam Soh.